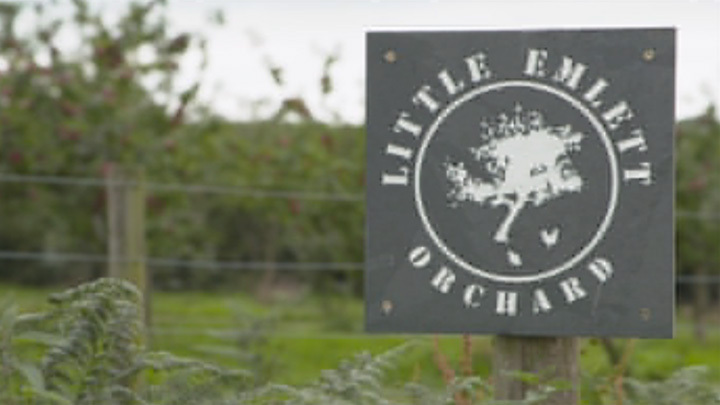 Little Emlett Orchard is a small family business in the heart of Mid Devon between the villages of Black Dog and Kennerleigh. We planted three orchards between 2006 and 2007 – about 500 trees. There was only one apple tree in the old orchard when we first moved here – what we think is a Newton Wonder, and its lovely bent silhouette became our logo along with our first two rescue chickens Peppa and Scarlet – deftly designed by my cousin, Alice (Alice Povey Illustration). We chose varieties of apples that we thought would taste nice as apple juice and that were a bit different to those you might find in supermarkets. We liked old Westcountry varieties, and heritage apples that might not originate from Devon but do well in this mild, wet and windy climate. We also chose a few modern seedlings that were discovered in Devon and are very productive and tasty! Most of our trees (and advice!) came from Kevin at Thornhayes Nursery before we started grafting our own. We make single variety apple juices – 100% apple juice, nothing else added. You can taste the characteristics of each variety – some clear and crisp, others sweet and cloudy. Sometimes we do small batches if a single tree has been prolific. We also make cider and cider vinegar. The apple cider vinegar is unpasteurised, with the mother, and said to be full of health benefits if taken regularly! The cider is currently made just for family and friends but I may be getting a licence soon …. Watch this space! We started making juice by hiring the Orchards Live kit and quickly realised we need our own equipment and dedicated space. We got LEADER funding (from the European Agricultural Fund for Rural Development) with REAL Devon in 2016 to help with Little Emlett Orchard – Next Phase, our project to buy our own press, mill, pasteuriser and to renovate an old barn. Since then we have expanded the amount of apple juice we can press and we offer apple pressing services to people and other businesses who bring their own apples to us. We sell our apple juices and cider vinegar at markets, fairs and festivals and we sell to shops, cafes, pubs, B&Bs, campsites etc. You can also order direct and we can deliver for free, if local.